Ken and Rik have shown superb mountain views from their parts of the USA. 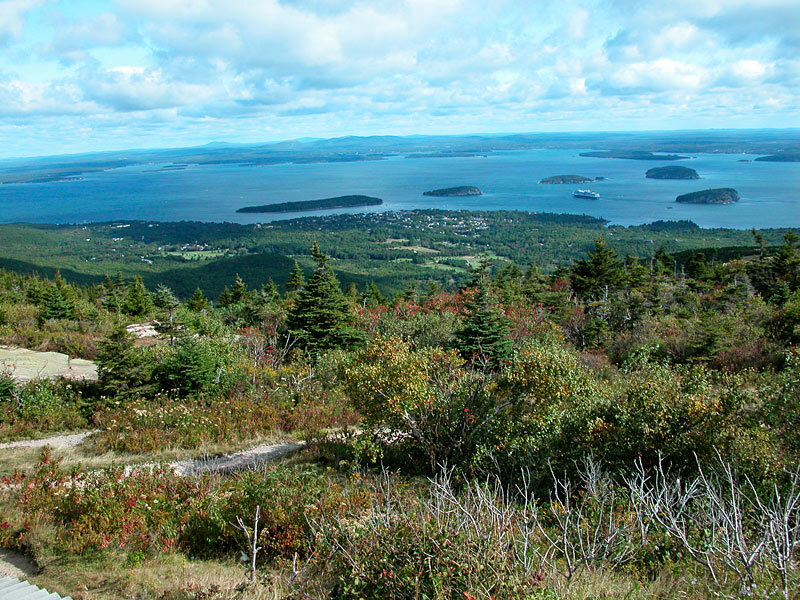 Cadillac Mountain, Acadia National Park, Maine, USA, is "my kind of mountain". At 1,532 feet it's the highest point along the North Atlantic Seaboard. 19 September 2009. From the top of the mountain: town of Bar Harbor in center, European cruise ship at anchor. CAN YOU GUESS WHY I LIKE IT? At the link, there's a snippet of text: "...tiny subalpine plants..."
I'm having a bit of cognitive dissonance with the thought of subalpine plants at only 1532 feet elevation, at a latitude that's even farther south than I live. Around here, subalpine is more like 5000 feet. Is this a case of the weather on top being made more severe just because it's the highest thing around? Or is the link perhaps using a definition of "subalpine" that's different from "just below treeline"? That looks like the kind of place that I could spend the day or maybe weeks in visiting. It appears as though there is quite a bit to explore and to study atop that mountain. I met a person from Maine a few years back and they remarked that, "if you like cold and snow for the better part of a year, then Maine is the place to live." Though they did admit, it was quite beautiful, as we see here. The shrub layer is very low in places, likely a response to very little soil and high winds; no idea if they are true subalpine spp. Why I like it: after a grueling 10 minute drive on a paved road, a paved parking lot at the top, it's just a very short walk to the store for coffee and cookies - my kind of mountain. Indeed, put down the bionoculars, the hand lens and the camera and go for snacks! I can relate to that. Oh, right! I was going to ask about those steps at lower left, but it slipped my mind. You know, come to think of it, Mt. Mitchell is like that. Nice wide paved highway leading to the summit, a short walk to the observation deck and the concession is only about a ten to fifteen minute walk away. Usually cinnamon rolls and a hot cup of coffee, to sit in silence and enjoy both as the clouds roll by. Now we're talking, after all that long, hard work getting photos, reward yourself with coffee and cookies. I can see the appeal. Edit: Sorry for the bumps, I didn't realize how old these threads were. Gosh, I missed this one. It's fab. Luck you! This is one of my favorite spots, too. My wife and I moved to Maine about six months ago and are about an hour away from Acadia. In northern New England, Treeline occurs at much lower altitudes than out west, say in the Rockies, in Northern New England. It's fascinating to look at their web page on summit meteorological conditions during periods of high winds and snow, and it is often remarkable on ordinary days. They aren't too far away from where I live on the coast near Portland, Maine (less than 100 miles). Their weather is very radically different for interesting technical reasons. BTW, one can arrange for winter visits to the summit using their tracked vehicle transportation if you're willing to obtain some certifications, etc. In the summer you can drive or ride the cog railway to the summit. The highest elevation that sustains trees; higher up, it is too cold or snow cover persists for too much of the year, to sustain trees. :151 Usually associated with mountains, the climate above the tree line is called an alpine climate,:21 and the terrain can be described as alpine tundra. In the northern hemisphere treelines on north-facing slopes are lower than on than south-facing slopes because increased shade means the snowpack takes longer to melt which shortens the growing season for trees. :109 This is reversed in the southern hemisphere. I personally find the weather in the Portland, Maine area to be "not so bad" - it has much less snow and is much sunnier than where I lived and worked for over 30 years (the Rochester, NY area in western NY state). I grew up in Atlanta, GA, though, and that is *radically* different in terms of climate! Too hot and much too humid for my tastes, now.